MY FIRST MUSEUM SHOW:”CHASING HORIZONS”!!! Opening Reception Friday, May 3 6:00 – 8:30 p.m.
Panel Discussion Begins at 7:00 p.m.
“How are present day artists responding to the land? Have technologies like satellite imagery and the internet demystified the landscape? How are artists in turn using these technologies to enrich and influence their work? Has the reverence for the landscape that artists like George Innes and Winslow Homer portrayed in their work diminished or increased in recent artwork?” These are the questions that curators Nirmal Raja and Christopher Willey are exploring in the upcoming exhibition Chasing Horizons; which opens at the Villa Terrace Museum of Decorative Arts on May 3, 2013. 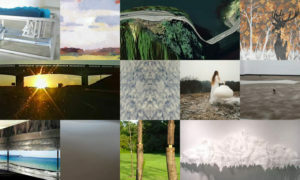 12 Artists will be exhibiting their response to the varied, open, and constantly changing concept of “landscape” through a variety of media such as digital photography, video, kinetic and site specific sculpture, paintings, and mixed media installations. Artists: Emily Belknap, Beki Borman, Crystal Ann Brown, Stephen Cartwright, Allan DeSouza, Kevin Giese, Tonia Klein, Dara Larson, Paul Ramirez Jonas, Alessandra Torres, Clement Valla, and Jason S. Yi.